Visitors to the Children’s Museum of Pittsburgh explore electricity using Circuit Blocks. PICTURE A MAKERSPACE. What do you see? A 3-D printer? A tangle of robotics parts? Perhaps it’s a teacher librarian volunteering hours to help students use iPads to shoot and edit movies. thinking much more critically about what factors determine meaningful making experiences. The maker movement has been going strong for over a decade, and some leaders in this field are questioning whether the pendulum has swung too far towards technology—and if it’s time to analyze what is at the core of making. Those might sound like blasphemous ideas for a movement that is often synonymous with getting kids excited about STEM, but they’re not. After all, tools and ideas that were novel 10 years ago are often outdated today. How can they stay relevant going forward? “Making can take many forms, and not all forms are best suited for all learning contexts or learning communities,” says Lisa Brahms, director of learning and research at the Children’s Museum of Pittsburgh (CMP), one of the partners in a nationwide effort to bring tinkering to communities around the country. She and others are calling for more thoughtful development of makerspaces. The partnership, funded by a $500,000 grant from Google and led by CMP and the Oakland (CA)–based Maker Education Initiative (Maker Ed), is called Making Spaces. Launched in 2016 with 10 regional hubs, it has now grown to serve 15 metropolitan areas. Each hub works with local educators, helping them develop the skills needed to start their own makerspaces. The hubs include a range of school districts, libraries, and museums, including the KID Museum of Bethesda, MD; Albemarle County (VA) Public Schools; and the Madison (WI) Public Library. Another hub is the San Mateo (CA) County Office of Education (SMCOE), situated between Silicon Valley and San Francisco. Robert Pronovost is the innovative learning and technology integration coordinator for SMCOE. Before starting his current job, Pronovost worked for years as an educational consultant in the Bay Area, where he saw some of the pitfalls of the rapid boom in makerspaces. The Exploratorium museum in San Francisco opened its own Tinkering Studio inside its building in 2010, after four years of development. 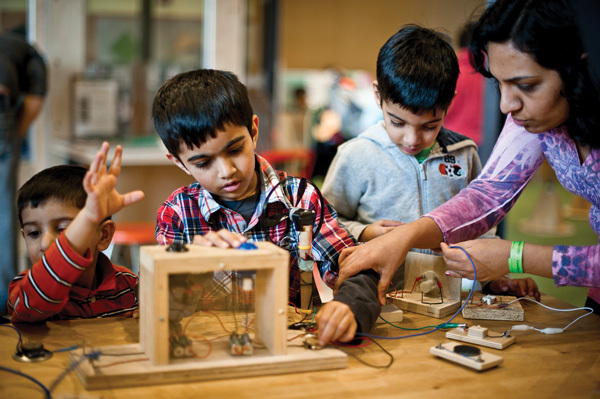 The museum has wrestled with issues of equity, a concern to many involved in maker education: Exploratorium staff wanted makerspaces to be accessible to all kids in the racially and socioeconomically diverse City by the Bay. To address that, the museum partnered with the Boys and Girls Clubs of San Francisco. 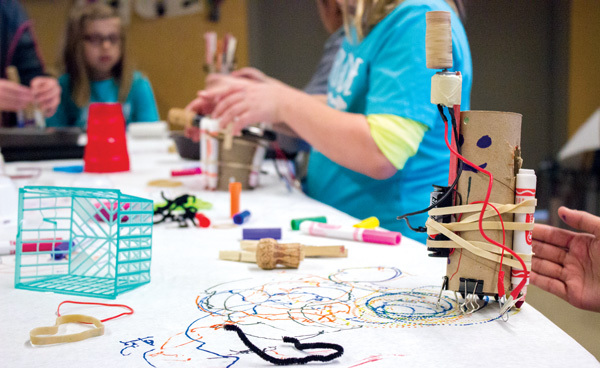 Each week, museum staff members bring maker activities to two clubhouses. Creating more equity in this area isn’t just about providing cookie-cutter STEM activities to less privileged communities. “We wanted to make sure the learning was really relevant and honored the cultural background and intelligences that these kids and families come with,” says Meg Escudé, program director of the Exploratorium’s Tinkering Afterschool Program. Escudé takes measures to connect work that youngsters may already see in their home with her tinkering activities involving scientific thinking. In one popular project, six- to 12-year-old children stitch notebooks in which they write observations of their activities. “When we brought in sewing, it was an incredible place for kids to start thinking about home,” says Escudé. “So often kids say, ‘I’ve seen my grandmother do this!’ ” This relevance invites family participation, and many caretakers stop and talk about the projects when picking up their kids. at the Scott Family Amazeum in Bentonville, AR, a Making Spaces regional hub. At the heart of the Making Spaces program is the idea that each school or community should build a curriculum that suits the needs of its population. Each regional hub holds monthly meeting with a cohort of local schools, libraries, and museums. Participants go through a two-year program, using a visioning toolkit to identify their population’s needs and goals. They then design maker activities that help students learn the skills to reach those goals. At the Scott Family Amazeum in Bentonville, AR, reverse engineering projects such as a toy take-apart activity reveal how things work. To address the financial realities, Making Spaces requires that participants run a crowdfunding campaign, which includes filming a pitch video and uploading it to an online platform. The hubs and schools select which crowdfunding platform they would like to use. Some have used Kickstarter or GoFundMe, while others have turned to Indiegogo, Donors Choose, or a platform run by a local school district. As the coordinator for 11 San Mateo County schools participating in the Making Spaces program, Pronovost is now working with teachers and administrators to take a step back and think about why they want a makerspace, instead of just moving forward and buying expensive 3-D printers or laser cutters. Even though crowdfunding may not raise enough to cover the total cost of equipment or personnel, Brahms believes that the process of making a case for makerspaces is a key step toward success. For example, in San Mateo County, one school was told by its superintendent that raising money in that manner violated district policy. Instead, the superintendent decided to allocate district funds to the makerspace. Almost any educator working with makerspaces can share anecdotal evidence of how tinkering has impacted students, whether it’s a kid who builds an app or an unmotivated student who is suddenly inspired to learn by tactile activities. Quantitative evidence is harder to come by. 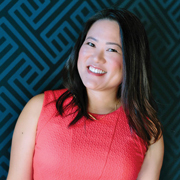 “A lot of learning outcomes that are developed aren’t necessarily measurable by test scores or grades,” says Chang. However, school boards or grant makers may want more quantitative proof that funds allocated to “tinkering” will be well spent. One way to measure outcomes could be to analyze the standardized test results of students whose teachers use maker activities. Sixth grade science teacher Amy Van Pelt of the Old High Middle School in Bentonville, AR, is exploring that. Her students do a lot of tinkering and open-ended exploration. Thomas points to existing Bay Area partnerships between schools and industry as examples of what maker activities of the future might look like. High school students in Fremont are working with drone manufacturer DJI to figure out ways that the technology might help police or fire departments deliver two-way communications during emergencies. 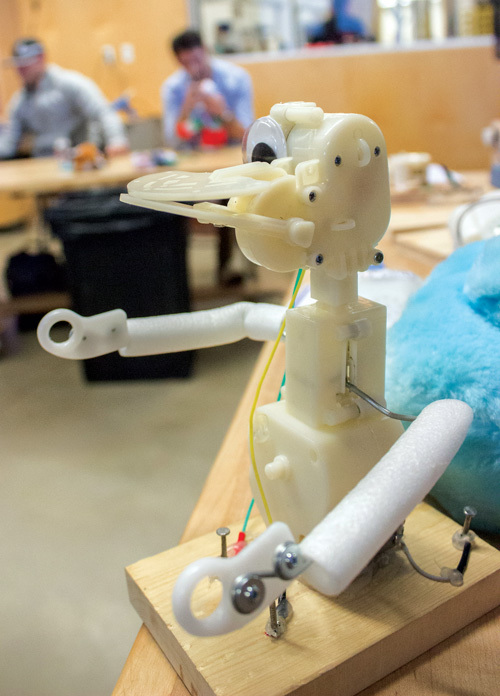 That’s just one take on the future of maker education. After all, what does the maker movement encompass, if not a willingness to take risks and to change course? Grace Hwang Lynch, a Bay Area freelance writer, blogs at HapaMama.com.